In Gartner’s hype cycle, users of a technology encounter a trough of disillusionment after the initial peak of inflated expectations. The use of Twitter by the 28 Members of the European Commission (Twitter list here) feels like being in such a deep trough that it’s almost as if this is not even social media at all any more. After the social media centred communications of Neelie Kroes in the previous Commission, with notable mentions to half a dozen other outgoing Commissioners, and the hope that social media might play a role in genuinely opening up EU institutional communications, the Twitter use of Juncker’s team is a clear step back in comparison to Barroso’s team*. That all 28 Commissioners are on Twitter is an achievement of sorts, but as so many of the accounts are so dull and unresponsive I am left wondering if its worth some of these Commssioners sorry, Commissioners’ teams, admittedly rather meagre efforts. Stats were compiled on 5.10.2015 using TweetStats and Twitter.com. 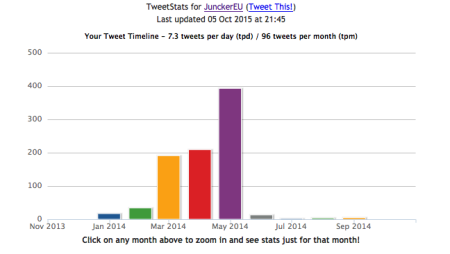 For some reason TweetStats cannot process data from Andriukaitis’s account. 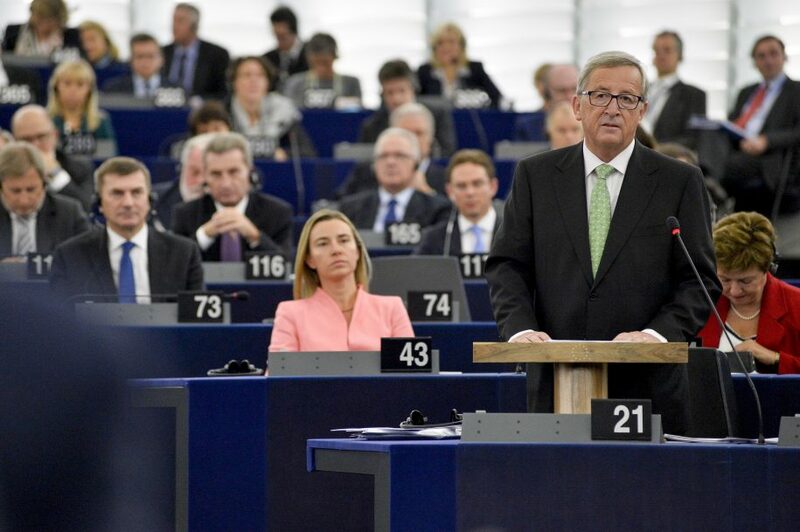 Commissioners in the first two groups – especially Juncker and Mogherini – command very large followings. Juncker’s account however has gone almost into hibernation since the 2014 EP elections though as the TweetStats graph to the right shows. Mogherini’s account seems to have progressively got less interactive as her responsibility has increased in Brussels – she is not setting a foreign policy agenda with the account, Carl Bildt style. At the other end of the scale, even though the Commission has been in office for 11 months already, 10 Commissioners have not even broken through the 10000 followers barrier! The performance of the new Commissioners who are new to Twitter is especially poor – fewer tweets per day, fewer @-replies, and following fewer other accounts than their peers who have been on Twitter longer. Overall the degree of engagement is pitifully low – only Mogherini, Dombrovskis, Georgieva and Vestager have more than 10% of their tweets that are @-replies. The chances of ever getting a response on Twitter from a Commissioner are spectularly low – Home Affairs Commissioner Avromopoulos’s account has never @-replied anyone at all according to the data from TweetStats. Pretty much all Commissioners’ accounts are regular retweeters – presumably RTing a press release from your own Commission DG is perceived to be worthwhile and not dangerous content. We must also return to the vexed issue of whether it is a Commissioner themselves tweeting (more on that here). While I would like to actually see a Commissioner writing their own tweets, I acknowledge this is not always possible – Malmström and Moedas are models of transparency here, explaining clearly when a tweet is from them or from staff in their biographies. From experience Vestager and Georgieva also tweet themselves. A whole slew of Commissioners state “Account managed by me and my team” in their Twitter biographies – these are @TimmermansEU, @Avramopoulos, @EBienkowskaEU, @Ansip_EU, @VeraJourova, @JHillEU, @TNavracsicsEU, @StylianidesEU, @Mac_europa, @MarosSefcovic, @MimicaEU, @JHahnEU, @GOettingerEU, @CorinaCretuEU, @V_Andriukaitis, @PhilHoganEU, @KarmenuVella. I assume that someone at DG COMM of the Commission told them this was a good idea; as far as I am concerned it’s not. If the Commissioner has no intention of using Twitter, fine, say so. If the Commissioner is on Twitter themselves, also please say so. But if you put “me and my team” and it is not clear I will just assume everything is the team. All of this leaves me wondering: is it even worthwhile doing all of this? Tedious content, broadcast out to meagre audiences, and as the audience with a tremendously low chance of ever getting a reply, pushes the definition of “social media” to its very limit. The odd Twitter chat doesn’t overcome the interactivity deficit, as Berlaymonster demonstrated in his classic post. Why did this happen I wonder? This Commission is more cautious and inward looking? Comms are more carefully controlled by Juncker? Everyone in Brussels is tired of Twitter? Whichever way all of this leaves me deeply unimpressed – carry on like this and there is no way the European Commission is genuinely trying to use Twitter to burst the Brussels Bubble! * – yes, I know I could have analysed MEPs, or perhaps even DGs Twitter accounts, but Commissioners remain the EU’s most important politicians, hence the decision to focus on them in this post.